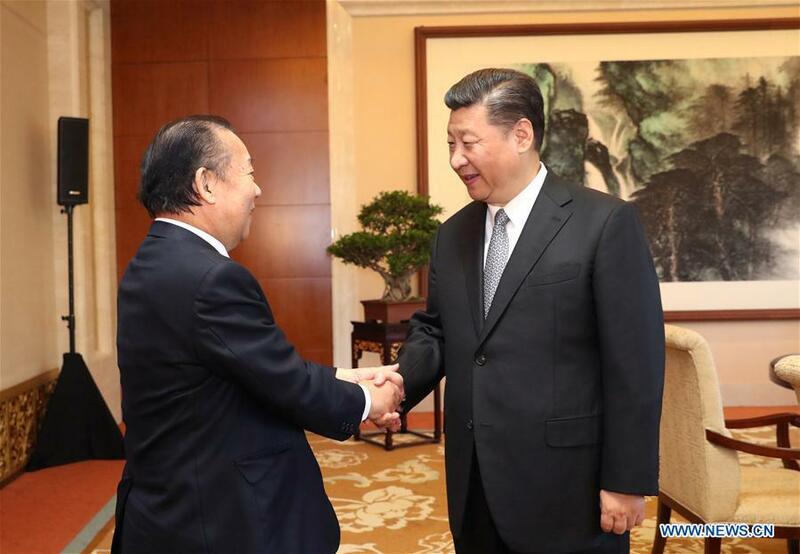 BEIJING, May 16 (Xinhua) -- Chinese President Xi Jinping on Tuesday met with Toshihiro Nikai, secretary-general of Japan's ruling Liberal Democratic Party, expressing the hope that joint efforts will be made to ensure bilateral ties develop in the right direction. Representing the Japanese government, Nikai attended the two-day Belt and Road Forum for International Cooperation, which concluded Monday in Beijing. Noting that 2017 and 2018 respectively mark the 45th anniversary of the normalization of China-Japan diplomatic relations and the 40th anniversary of the signing of the Treaty of Peace and Friendship between China and Japan, Xi said bilateral ties are faced with both new opportunities and outstanding challenges. To improve the bilateral relationship, the two sides should abide by the four political documents and the four-point agreement between the two countries, and uphold the spirit of taking history as a mirror and looking forward to the future, Xi said. The president said he hopes friendly people in both nations, including Nikai, will continue to pool positive energy for the improvement of bilateral ties. Xi stressed that since the normalization of China-Japan diplomatic ties, the bilateral relationship has seen great improvement thanks to the joint efforts by people with vision in both countries, which has brought tangible benefits to the two nations and the two peoples and played an important role in regional peace and stability. History has proved that peace, friendship and cooperation are the only right choice for the two countries and meet the expectations of people in the two countries and the international community, Xi said. Xi stressed that reflection should be done to detect the root of the problems that have disturbed the improvement of bilateral ties, and take effective measures to change the situation. As major economies in the world, China and Japan share common interests in promoting economic globalization and trade liberalization, Xi said, underscoring the Belt and Road Initiative can become a new platform and an "experimental plot" for the two countries to achieve mutually beneficial cooperation and common development. Japan is welcome to discuss cooperation with China under the framework of building the Belt and Road, Xi said, noting Japan has clearly affirmed the initiative. Nikai congratulated China on the success of hosting the Belt and Road Forum for International Cooperation. He said Japan and China need to cooperate, expressing the hope that the two countries can have various activities commemorating the two anniversaries, so as to spur the development of bilateral ties.